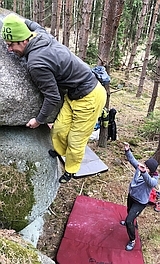 The biggest choose of crashpads is in Boulder Shop - V Jámě 6.
i'm looking for a way for my brother and I to go climbing in cesky krumlov in july but I really dont know how I have to start looking if it's better to hire a guide or to go with a group and where can I find those groupes ?? Are you guys covering the kranj world cup. The coverage on the last was awesome. Great fotos and video clips. I am looking for the same on the final with all the drama involved. Any help? I am sorry, we are not going to cover it. We are in Czech Republic and just got some sms from Kranj. last time I was suceeding in this forum, so I try it a next one to looking for something! Searching for the safety specifications for Viamont tricams - can anyone help? Ahoj! Jsem z Spanelska, studuju v Brne.Now in english: i'm looking for a partner to go to iceclimbing and go to mountains,and why not?improve my czech.Dekuju. I´m from Austria and I´m looking for "half-ropes"! I think Lanex would be a nice choose, or is there another producer in Czech? Yes, it is something, like you wrote. So some info concerning the questions has been added today. Thanks for the questions. thanks a lot for all these good informations. i'm from Poland and i'm going to visit Czech so i'm looking for adresses of shops in Prague with ropes, shoes and other climbing stuff. i hope you can help me :) please write on my private e-mail adress (which is wkurowski@wp.pl) because i don't visit this forum very often. Hi, the name is bouldermatka and bouldermatky in plural. I am not sure if they are on the catalogues displayed at the sites. But I know they are among the suply in Hudy Sport shops, so you can write there a mail. hello i'm mara from italy i'm looking for gothic shop in prague with gothic clothes... please help me!!! bye! Hi mara, you are probably out of the topic of this site. i hope your question will someone delete soon. hi mara. i arrived in prague 3weeks ago. i am also looking for some goth shops in prague. i found a few, but not that nice and very small ones. i could show you someday if you want to. otherwise, i heard about one but not in prague, somewhere more in the south of czech republic, looks interesting.